Today we start a new study, “The Law and Sin.” We’ve all heard of THE LAW. THE LAW of Moses. THE LAW and the prophets. The TEN COMMANDMENTS (delivered in the voice of James Earl Jones). THE LAW and grace. OK. So what is it about the Law that’s so important? Well, the first important thing about the Law is that it was given to us by God. David tells us that God’s law is perfect, that it restores and rejoices us, and that it is more to be desired than gold. One thing David especially likes is that the Law warns us and keeps us from presumptuous sins, a topic we’ll come back to in a few weeks. Americans tend to be Constitution-proud. We think every nation on earth would be well off to have a constitution similar to ours, elections like ours, and apple pie that tastes as good as ours. So they were right. 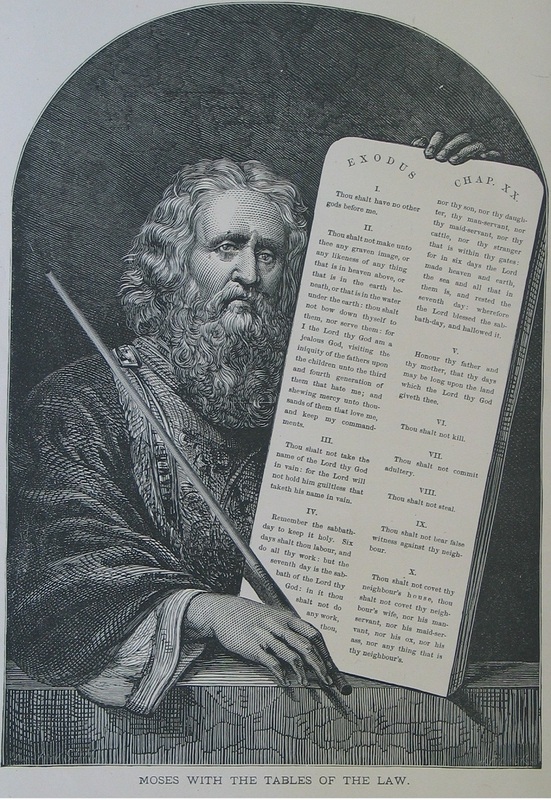 God gave the children of Israel a righteous Law. Quick! How many commandments are there? If you answered “10,” then probably you have watched too many Charlton Heston movies. Actually there are 613. Personally, I have to think for a bit to come up with 10, so remembering 613 is probably beyond my capabilities. Now, I suspect that all of the 613 are important, and I suspect (as some people might not) that I could find a modern application or parallel for every single one of them. I’m just saying I couldn’t possibly remember them all. So it is gratifying to me that the prophets tended to take a very high-level view of the Law. When Micah says, “You have been told what is good,” he doesn’t enumerate 613 or even 10 commandments. He gives us three: do justice, love mercy, walk humbly with God. Amos also gives us three: hate evil, love good, establish justice. These summaries of the Law are by no means easier to do, but they are easier to remember. Reader Response: I thought it was the Ferengi who had 613 rules of acquisition. The psalmist says that abiding by God’s Law makes us happy. A quick web search didn’t turn up anything on that one way or the other, but think about this. When the Albuquerque Journal publishes the photos of DWI offenders, property-crime offenders, etc., how many of them look happy? OK, a few may be unhappy because they were wrongly convicted, but most of them are (a) guilty and (b) unhappy. So, your call on whether to walk in the law that God gave us and be happy, or violate his laws and (usually) get arrested. What’s the deal on “ALEPH”? Psalm 119 is an acrostic psalm. This means that each line in a given section starts with the same letter, and the sections are in alphabetical order. Vss. 1-8 start with aleph, vss. 9-16 start with beth, etc. Really hard to see this in translation, because it’s difficult to impossible to find 8 words that start with the same letter and make sense as the start of a sentence that is a reasonable translation of the verse. What are you going to do with X, for example? The first important thing to know about the Law is that God gave it to us. 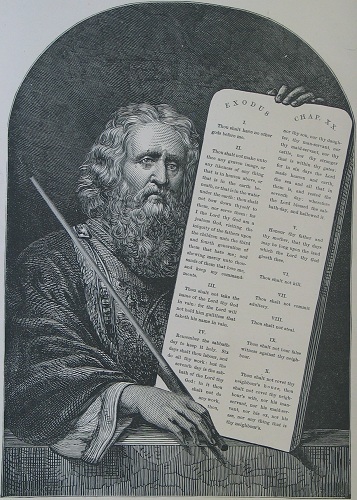 The woodcut of Moses with the tablets of the Law is from the Gartin family Bible, now in the private collection of Regina Hunter.